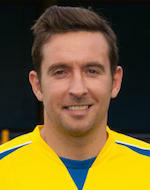 Experienced midfielder who has returned to football following a spell out of the game. Signed for the Saints in the close season, having impressed with his eye for goal. Best known for his time at Wealdstone, he has also appeared for Hayes, Hemel Hempstead Town, Northwood and Flackwell Heath.